Cowley College welcomes and accepts for admission students from around the world that are able to meet certain academic, language, financial, and visa requirements. Cowley College reserves the right to deny a student admission, or readmission, if it is determined to be in the best interests of the college community to do so, or if the college is unable to provide the services, courses, or program(s) needed to assist the student in meeting their educational objectives. Cowley College is committed to providing a quality experience for our international scholars and welcome the cultural exchange that they bring to our campus. We believe that it is important for American students to become familiar and comfortable with other cultures, and that it is beneficial for international students to know the beauty and strength of the Midwestern United States. 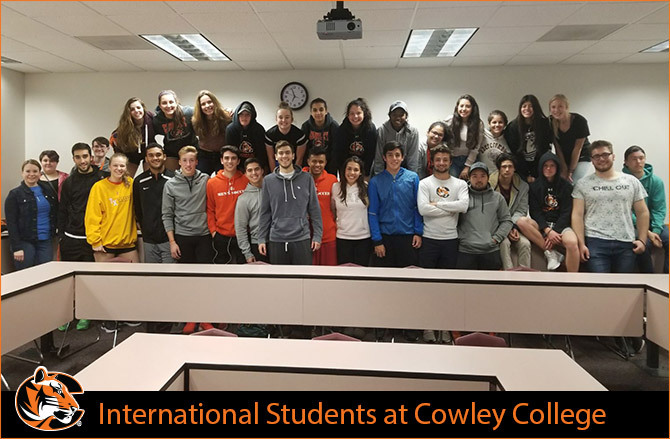 Those international students interested in attending Cowley College, please contact the international office via email at international@cowley.edu. The deadline to apply, submit documents, or request deferments for the Spring semester is October 1. The deadline to apply, submit documents, or request deferments for the Fall semester is April 1. The I-20 is a Certificate of Eligibility for Nonimmigrant Student Status for those who wish to study in the U.S. The I-20 form must be taken to the American embassy or consulate when you apply for a visa. Cowley College welcomes international students from across the globe and would love to help you reach your educational goals. We offer affordable tuition for our internationals and our credits transfer to all major US universities. Go to our “Steps to Apply” to learn how to become a Tiger! Please fill out this form if you have questions and the International Student Services Coordinator will contact you to answer your questions.